Jose offers Vojta Therapy and neurological physiotherapy for children and adults, as well as developmental checks for children with no neurological conditions. Jose Manuel Sanz Mengibar started his career as physiotherapist in Madrid, supervised by the most important Rehabilitation Paediatric Consultant in Spain, specialized in Vojta Therapy. He has worked and collaborated in Early Intervention Centres and Neurorehabilitation Clinics in Rome, Rio de Janeiro and Munich. Jose started working in the UK in 2008. 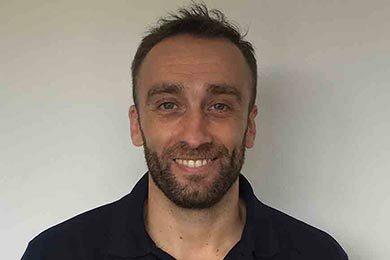 After one full period in London, he now comes over on a fortnightly basis combining his work at Balance Performance with his clinical work in Madrid and his Vojta Therapy teaching training in Germany. His clinical training includes a postgraduate training in physiotherapy in paediatric neurological disorders, Official Master Degree on neurological rehabilitation, Official Vojta Therapist diploma from the International Vojta Association (Internationale Vojta Gesellschaft e.V, Germany), Basic Bobath Fundation Course (Bobath Centre London), Myofascial release, dry needling, respiratory physiotherapy and kinesiology taping. • Sanz Mengibar JM, Santonja-Medina F, Sanchez-de-Muniain P, Canteras-Jordana M. Can Clinical Assessment of Locomotive Body Function Explain Gross Motor Environmental Performance in Cerebral Palsy? J Child Neurol 2016; 31 (4): 474-480. • Sanz-Mengibar JM, Altschuck N, Sanchez-de-Muniain P, Bauer C, Santonja-Medina F. Position between trunk and pelvis during gait depending on the gross motor function classification system. Pediatr Phys Ther. 2016, In press. • 7 physiotherapy books in Spanish language, including: “50 ejercicios para tu bebé. (50 exercises for your baby)”, “50 preguntas y respuestas para padres y bebes (50 questions and answers for fathers and babies)”, “50 consejos para calmar el llanto (50 tricks to calm and stop babies crying)”, “Masaje para bebes. Ejercicios y estimulación (Massage for babies. Exercises and sensory work), “Manual de masaje” (massage handbook). ➢ Central motor disorders such as cerebral palsy. ➢ Peripheral or secondary motor palsies: Neural tube defects, Obstetric brachial plexus palsy (OBPP). ➢ Breathing, sucking, swallowing and chewing problems. ➢ Developmental checks for children with no neurological conditions but never-the-less you may have concerns about your childs progress. ➢ Back-spine postural disorders – misalignments (scoliosis), pain and functional limitations. ➢ Joint misalignment including Congenital Hip Dysplasia, hip subluxation, hip luxation. Jose’s sport background is competition Artistic Gymnastics, grading his experience from motor disability to high-level competition at any age. Jose speaks fluent English, Spanish, Italian, and can also provide therapy in German language.